Everyone can benefit from following the standard guidelines for oral health: flossing daily, brushing twice daily, maintaining a healthy diet, avoiding tobacco use, and having regular dental checkups. Staying on top of your oral hygiene will help you avoid gum disease and will keep your teeth healthy and strong for a lifetime. However, particular groups of people have unique concerns when it comes to oral health. Periodontitis, the advanced stage of gum disease, is uncommon in children. But gingivitis, the first stage of the disease, is quite widespread in children and teens. Be aware of the signs of gingivitis: swollen, red, tender or bleeding gums. During puberty, gum sensitivity can increase with hormonal fluctuations, leaving teens at a greater risk of gum disease. With good home care and professional cleanings, gingivitis can be prevented and treated. Gum disease runs in families, so if one family member has experienced gum disease, everyone else should have screenings. Also, bacteria can be spread through saliva, so avoid sharing forks and spoons, especially if any signs of gum disease are evident. 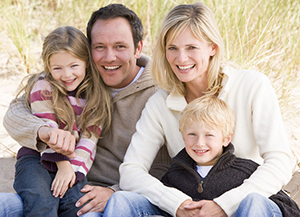 As with adults, children with particular systemic conditions are especially susceptible to gum disease. These conditions include diabetes, Down syndrome, Kindler syndrome and Papillon-Lefevre syndrome. If your child has one of these conditions, let us and your general dentist know. If your child suffers from gum disease, especially long-term, treatment-resistant gum disease, it may be an indication of a systemic condition. The best way to prepare your child for a lifetime of good oral hygiene is to establish good habits early on, act as a consistent role model, and schedule regular checkups for professional assessment and cleaning. The stronger the habits of brushing and flossing are in young children, the more likely they are to continue these habits through adolescence and adulthood. Because women experience stages of increased and fluctuating hormones, they are more susceptible than men to gum disease and other oral problems during certain times of life. Periodontists have even created terms to describe some of these situations: pregnancy gingivitis and menstruation gingivitis. During both pregnancy and the monthly cycle, as well as during puberty, fluctuating hormones alter the reaction of gums to irritants like plaque, creating a higher likelihood of red, swollen, tender or bleeding gums. Pregnancy carries special implications for oral health. The risk of gum disease is higher, and the potential effects of gum disease are critical, as research links gum disease to an increase in both premature labor and low birth weight. Be sure to let us and your general dentist know if you plan to become pregnant so we can take extra precautions against gum disease. Age, medication, and hormonal changes combine during and after menopause to create special oral circumstances. Women may experience altered taste, increased temperature sensitivity, burning sensations, or dry mouth. These conditions can lead to gum disease, which can be exacerbated by osteoporosis. A strict regimen of brushing, flossing and professional cleaning can help avoid trouble during this time. Adults are living longer and keeping their natural teeth longer than ever before. Nevertheless, the American Academy of Periodontology points out that older people have the highest rates of gum disease and need to do more to maintain good oral health and protect themselves from tooth loss. Older adults commonly take medications that come with oral side effects such as dry mouth, altered taste, and changes in soft tissue. Arthritis and other mobility issues can make daily brushing and flossing more difficult. Osteoporosis, most common in older adults (especially women) can increase bone loss in the jaw, leading to tooth loss, especially in combination with gum disease. Let us or your general dentist know about any medications or mobility problems that affect your ability to take proper care of your teeth. We can recommend ways to overcome these issues. More older adults are opting for dental implants over dentures and bridges. Implants look and feel more like natural teeth. Whether you have implants or conventional dentures and bridges, it's vital to retain the same level of care that you would with natural teeth. If an accelerated risk of lung disease, heart disease, stroke, and cancer aren't deterrent enough, smokers and tobacco users also are at an increased risk of all manner of oral problems, including decay, tooth loss, bone loss, mouth sores, gum recession and oral cancer. Patients who smoke find that dental and periodontal treatments are less successful than with non-smoking patients because the chemicals in tobacco slow the healing process. Smoking and tobacco use are also major risk factors in the development of gum disease. Regular smokers and tobacco users tend to experience more deep pockets between the teeth and gums, more tartar and calculus on the teeth, and more bone loss and tissue loss than non-smokers. All of these conditions add up to periodontitis, the advanced stage of gum disease. The American Dental Association estimates that smoking may be responsible for almost 75% of gum disease among adults.